Discussion in 'Guitars in General' started by johnny marks, Apr 14, 2019 at 1:57 AM. I currently own a epiphone dot that i purchased used for $100 a while ago . My question is. Is there a big difference in sound compared to a sheraton ii pro or lucille honestly dont care about cosmatics or anything that dosen't affect the tone and sound. I have some one who wants to purchase my dot for $200 would it be worth it to sell it and put some cash out of my pocket for a used lucille or sheraton or keep mine and upgrade it. I also heard upgrading semi hollows are a pain so if they do sound noticeable better i would rather sell my dot to not deal with the hassel of upgrading it. But if i upgrade my dot can i get it to sound better then a Lucille or Sheraton. Also if i get a Sheraton or lucille if i upgrade those can i get a even better sounding guitar then the dot upgraded? I have had Epi dots and a Lucille. Lucille tone was creamy, smooth. The neck was thicker than any of the epi dots that I had. I had a 2007ish Epi Lucille and the neck was HUUUUUGE. Sounded amazeballs. Ugh, I hope they didn't make that a permanent thinnner neck change to more recent models. I don't exactly follow your math, but it seems like you would need to spend a lot more money to get a marginally better guitar. Not that that would ever stop me. Where have you seen them? My luthier friend just happened to have an old brass bridge with identical post spacing to my 90s Sheraton but it altered the string spacing over the pickups. EDIT - Kluson makes them. Nice. Google searching brings up all the old posts on various forums of people asking about replacements but scrolling further down I found listings on Reverb and WD Music. Strat Cat 63 likes this. I saw them on a Kluson email that I opted in for. They have been doing a lot of "new product" mailers. They also have a narrow spaced trem that fits the old style 6 screw US trem with 2 7/32 inch mount but shores up the spacing to 2 1/8 I think it said. When I shopped for my semi-hollow a few years ago, I played LOTS of them, including all that the OP mentioned, plus Ibanez, Eastman, and Hagstrom. There was enough variation amongst those that I played (new and used) to render any blanket statement impossible. For instance, I played 2 Epi Lucilles and one had a small neck, the other much larger. They were both heavy. I bought an Eastman, but my second favorite was a well worn Sheraton II. OP, if you like the way your Dot feels, I would keep it and upgrade parts over time (or not, if you like it as is). Or, if you can put your potential buyer off for a few days, go play some other guitars and get an idea of what you may like in your price range. I still had my original bridge in the case. I just did my first ever bridge swap, replacing my luthier's brass bridge for the original. Set the height, adjusted the intonation and she sounds beautiful and the string spacing over the bridge pickup is where it's supposed to be again. The saddles were starting to wear which is why I replaced it initially so I'm going to grab one or two of the Kluson bridges. My Sheraton is my workhorse and a keeper and it'll be good to have backup bridges. The specs on WD Music say they're 72mm post to post which is exactly what mine is. It's funny. I started playing guitar when I was a kid 34 years ago and only started doing my own setup work in the last year. And it's not that hard. I'm thinking of upgrading the stock pickups too, to Gibson '57 Classics... but that'll be a job for my luthier. Action, intonation and truss rods adjustments, sure but pickups and pots and electronics are beyond my skill set or patience level. All epi's of the same model are not the same. In fact measure so you do not overlook something weird. I very happily toured with a late 90's Sheraton II for a few years. Limited range of tone, but genuinely enjoyed how it played and sounded. To echo others' sentiments, play the one you're going to buy beforehand. Epiphone Hollow bodies in general very a great deal from guitar to guitar. Try before you buy, I cannot stress this enough. Dots have been around a long time now and built in various factories and countries. Watch for body width and depth, neck and frets, cutaway spacing, and pickups. Check everything! You may find one you like better..or not. 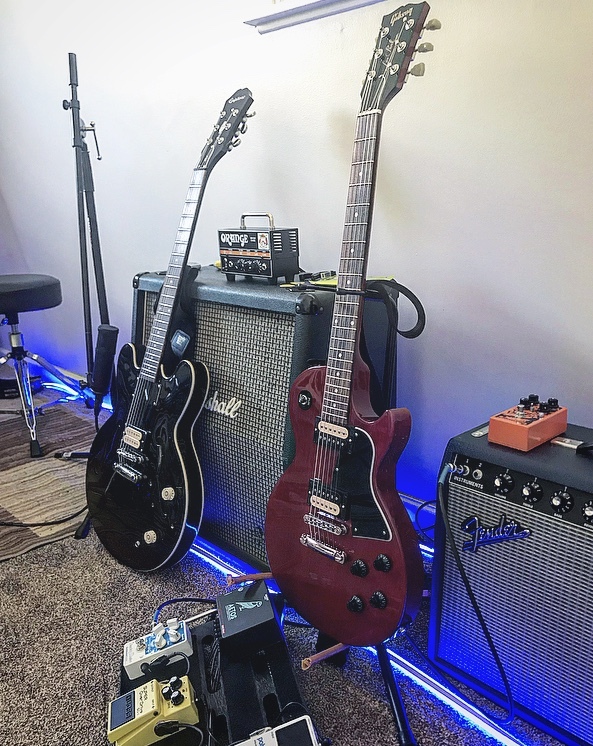 Can't speak for the Dot or Lucille, but I love my Epi Sheraton. Mid-2000s, 5 piece neck and I changed the stock Epi pickups to classic 57s. Sounds perfect. In front of my Metroplex, it's instant Anthem by Rush tones. I wouldn’t consider a pickup/electronics swap on a semi hollow had, it can be time consuming. If you like how the Epiphone feels and sounds acoustically, I might just upgrade it. I don’t know what all the Lucille has over the Dot though. If you do rewire the Dot, I recommend making the input jack wiring extra long so you can pull the electronics out without needing to pull the jack out if you need to go in at a later date. Hi! I own an Epiphone Dot. A few years back I went through the same thing. I kept my Dot but purchased an Epiphone Sheraton II Pro. So, I got to play both at the same time. My Dot is heavily modded. I put a Dimarzio Super Distortion in the bridge and removed the neck pickup (I don't ever use the neck pickup). Upgraded the electronics and wired everything myself. This guitar is amazing. I always go back to it. It feels like home. Heck of a guitar. I liked the Sheraton II Pro enough. Personally, the neck was too thin for my tastes. I didn't care for or use the split coils (that's just me though). It just never played as well or sounded as good (to me) as my Dot. TOO LONG DIDN'T READ: Keep your Dot and upgrade it! You can mod a dot to be superior to a Sheraton.